Loads of Blood, Guts and Aliens in this classic first person perspective Shoot-em-up written exclusively for the PPC. The game utilizes our custom realtime ray-casting engine to deliver a realistic 3D playing environment. StompBox Free is the latest iPad music application from 4PocketsAudio, the creators of Meteor Multi-Track recorder and StompBox guitar effects rack, which featured in Apple�s iPad 2 TV commercial in January 2012. StompBox Free turns your iPad into a flexible Multi FX Processor which comes with 3 free effects; Delay, Reverb, Chorus and a further 16 Effects to choose from in the Online store. StompBox Free supports AudioBus and Apple�s Inter-App Audio making it an excellent general purpose audio processing tool for all musicians, not just guitarists. Meteor Multitrack Recorder is the music application from Limelight Software/4Pockets.com, the creators of Synergy Studio and StompBox guitar effects rack, which featured in Apple�s iPad 2 TV commercial in January 2012. There are four main instrument categories to choose from: Drums, Analogue Synthesizer, Sample and Pad Synth. Each category contains different types of instruments - for example in the drum kit category you can choose from an array of different kits including Analogue T9, Orchestra, Rock and Techno. Further instrument packs are available in the Synergy�s free sound library or as In-App purchases. � Choose your pattern length from 16, 32 and 64 notes. � 11 Drum Kits, 42 Analogue Synth instruments, 55 Sampler instruments, 21 Pad Synth instruments. � Further instruments available from free Sound library and in-App purchases. � Edit existing instruments to create new ones and save them to use again. � Easily connect and interact with other MIDI controls. � Fully integrated mixer and effects unit available. � 3 BAND Parametric EQ on each of the 16 layers to control the tonal content of a layer. 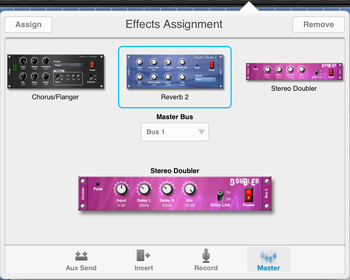 � Automate panning, fading and effects using the mixer. � Export and share to other iOS devices via Bluetooth, Pasteboard, SoundCloud, DropBox, Email and FTP. � Relaxed the profanity filter on file names. � Added Undo button to toolbar. � Added Record Monitor button to toolbar. � Added pasteboard options to audio pool to allow pasting of stereo content. � Added an Auto Save Facility to the Options menu. � Save purchases immediately after purchase. We are pleased to announce that Aurora Sound Studio for the Apple iPhone will be released on Friday 21st May at an special introductory price of $9.99/�5.99. So get ready to make sweet funky music on your iphone. Whether you are an experienced musician or don�t have a musical bone in your body, you can make great music on your iPhone, with Aurora our pattern based musical sequencing software. Click Here to vote for Marble Worlds 2 as Best Casual Game in the 2009 Handango awards. 4Talk The possibilities are endless�.